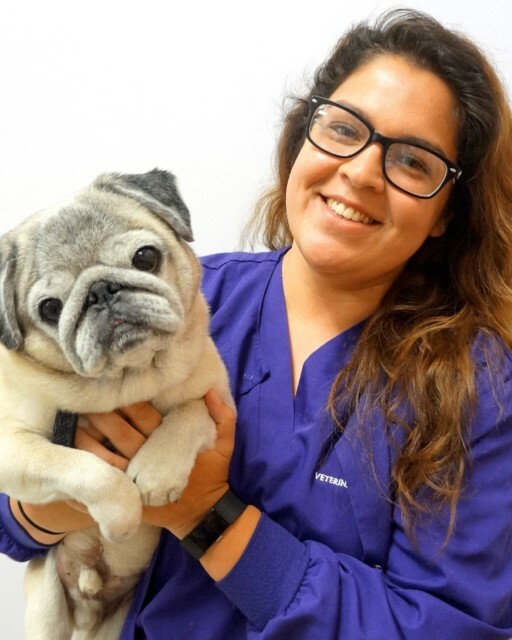 My name is Liz and I have been in the veterinary field for 9 years as a receptionist . I am currently going to school to become an RVT. I have a desert tortoise named Bowser. When I’m not working, I spend my free time with my three little best friends, my kids . "I wanted to take a second to say thank you to all the staff at OC Vet. From the bottom of my heart, I really appreciate how much the staff went above and beyond for us. We had such a great experience In this difficult time with the loss of our fur baby. I would give you guys more than 5 stars if I could. When I came to pick up my dog's ashes it was more than expected it was in a nice wooden box with her name engraved on the top and her paw print. I was very touched to also get a handwritten card with messages from the staff it really touched my heart. It's good to know that there are still genuine people out that truly care about our animals. Thank you again." " The best vet services we've ever had. The staff is upfront and honest with costs and never try to up-sell you unnecessary services. They're courteous and communicative, Dr. Horn is genuine and thorough. The office is always clean, and their customer service is unmatched. Can not recommend them enough! " "I want to thank OC Veterinary Medical Center for making our first visit to a vet in years personal and caring. My dog Lexii is 8 years old and obviously terrified of vets! But Lexii didn't seem to be bothered or nervous around such a positive environment. I got all the answers to the questions I had and they worked with me and my budget. Thank you"
" When I got my new puppy I wanted to find a vet that followed the new, healthier shot protocol of vaccines being given every 3 years and OC Veterinary was the only one I found. I have taken their puppy kindergarten class enjoyed it and learned a lot. Everyone there is attentive, professional and truly care for my Lacey. I have seen three of the vets, and have left the appointments with all my questions answered and feeling confident that all my concerns were addressed and resolved. Kudos to OC Veterinary. " " We've been bringing our dog, Franklin, to OC Vet for boarding any time we need to travel. The staff is ALWAYS courteous and ALWAYS remembers Franklin. We had a terrible experience with another boarding facility, and it's a night & day difference -- Franklin is always happy to go to OC Vet, and is always happy whenever he leaves. The staff is also super accommodating, allowing us to bring Franklin's own food, and some of his favorite things to keep him company. I also LOVE that they send a daily text message with a picture so that we can see how he's doing. If I could give more than five stars, I would do it in a hot second! " Our new state of the art animal hospital was founded here in Orange in February 2012 with the goal of providing top quality medicine, comfort for our patients, and using technology to help educate pet owners so they are an active participant in their pet’s health care plan. Beyond preventative health, we also have a veterinary surgical specialist, cardiologist, and radiologists who assist us in patient care. Our fully digitized veterinary hospital allows us to get lab work results within minutes and allow us to share information easily with specialists in the county. Our doctors have been practicing for years in Orange County and know the unique needs of pets in our area. We can't wait to meet you and your pet! © Copyright 2019 - OC Veterinary Medical Center. Veterinary Marketing powered by iVET360.